This step by step diy woodworking project is about flat roof double carport plans. 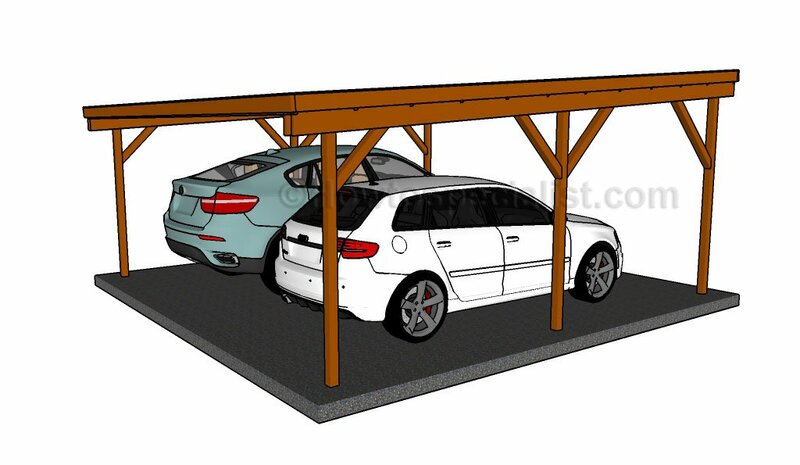 If you want to learn how to build a double car carport with a flat roof, we recommend you to pay attention to the instructions described in the article and to check out the related projects. There are many storage projects featured on our site, so don’t be afraid to browse through the rest of the woodworking plans. Before starting the actual construction project, we recommend you to plan everything, as to save money and to keep the costs under control. Adjust the size and the design of the wooden carport to suit your needs. In addition, we recommend you to invest in high-quality materials, such as pine, redwood or cedar, as they have a nice finish and are highly durable, especially in a humid environment. The first step of the woodworking project is to lay out the carport in a professional manner. Therefore, we recommend you to use batter boards and string to make sure the posts will be properly placed. Apply the 3-4-5 rule to each corner of the layout in order to check if they are perfectly square. In addition, make sure the diagonals are perfectly equal before setting the posts into place. Next, you need to cut the posts at the right size, making sure you need to fit them about 3′ into the ground, before adjusting their dimensions. Setting the posts in concrete is essential for the rigidity of the carport. As you can easily notice in the diagram, we recommend you to dig 3′ deep holes and to pour 2″ gravel on the bottom. Install the tube forms to the holes. Secure the posts with braces before filling the forms with concrete. Smart Tip: Alternatively, you could use posts anchors. Secure the metal anchors into concrete, as to lock the wooden posts into place properly. Align everything with attention and with great care. Next, install the 2×6 support beams to the top of the posts. Use clamps to secure the beams to the top of the posts. Drill pilot holes through both the support beams and through the posts before inserting the 7-8″ carriage bolts. Leave no gaps between the components and lock the components together tightly. Make sure the carport has appropriate overhangs, in order to allow the water to drain properly. If you live in a windy area, you should install 4×4 braces to the flat roof carport. Cut both ends of the braces at 45 degrees and secure them to the structure, as described in the diagram. Drill pilot holes before inserting the screws and leave no gaps between the components, for a professional result. Smart Tip: Always plumb each post before fitting the components. After fitting the braces, install the opposite support beams. Install the support beams to the other side of the carport, using the same techniques described above. It is essential to make sure the beams are at the same level, otherwise the roof won’t be level. Build the rafters out of 2×6 lumber. Cut the components at the right size and smooth the edges with sandpaper. Make notches at both ends of the rafters, using the information from the diagram. Make parallel cuts inside the marked area and remove the excess material with a chisel. Smooth the cut edges with fine-grit sandpaper and remove the residues with a damp cloth. Place the rafters equally-spaced and and secure them to the support beams using 4 1/2″ screws. Align the rafters at both ends before inserting the screws, to get a professional result. One of the last steps of the project, is to fit the 2×6 trims to the exterior of the rafters. The top edge of the rim rafters should be 3/4″ over the rafters, in order to get a professional result. Secure the trims to the frame of the carport using 2 1/2″ screws, every 8″. Use a spirit level to make sure the bottom and the top trims are horizontal. Build the roof out of 3/4″ plywood sheets and lay them to the rafters, as described in the diagram. Align the sheets at both ends and lock them to the rafters with 1 1/2″ nails or screws, every 6-8″. It is essential to close the gaps between the sheets, if you want to get the job done as a professional. Make sure the surface is even and the screws are not protruding. You could fit asphalt shingles to protect the carport, as it is a straight forward solution. Therefore, install roofing felt over the roofing sheets, making sure the strips overlap at least 2″. Secure the tar paper to the plywood sheets with roofing staples. Fit the side drip edges over the roofing felt, while the bottom drip edges should be fit under. Place a starting course at the bottom of the roof, before installing the asphalt shingles. Always read the manufacturing instructions before starting the installation, as there are several aspects that differ. Smart Tip: Start the first course with a 3-tab shingle, the second course with a 2 1/2 tab, the third course with a 2 tab, the forth course with a 1 1/2 tab, the fifth course with a 1 tab, the sixth course with a 1/2 tab. Repeat the process from the beginning, starting with the seventh course. Don’t forget that the shingles should overhang from the drip edge about a 1/4″. In addition, secure the asphalt shingles to the roof decking with tacks. The flat roof carport has a neat appearance so that it can match the style of any home. Last but not least, we recommend you to take care of the finishing touches. Fill the holes with wood filler and let it to dry out for several hours. Check out the rest of the outdoor projects, to see more ways to improve the look of your garden. Smart Ttip: Apply several coats of stain or paint to the wooden components, if you want to protect them from decay and to enhance the look of the flat roof double carport. Thank you for reading our project about flat roof double carport plans and we recommend you to check out the rest of the projects. Don’t forget to share our projects with your friends and LIKE us, by using the social media widgets. SUBSCRIBE if you want to be the first that gets our latest articles and to help us create more free plans. The slope is from front to the back of the carport, not from one side to the other. That is why the three posts have different sizes. 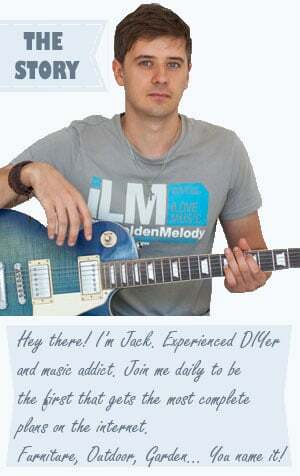 Jack…Tim is not only right on that, but your material list is horrible!! 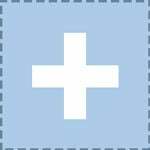 There are 8-braces (B) that are 2×6, which are mounted to 4×4 posts (A)? These are sandwiched between the lengthwise 4×4 braces (C) that are attached on each side of the 4×4 posts (A)?? There would clearly be a GAP…OK? If the braces (B) were all 4x4s, or doubled-up 2x4s…OK. The basic design is fine, but your list and the dimensions as shown are ridiculous. I would edit this plan using 4×4 braces and include counter-bored holes (to include washers and through-bolts) through the braces and posts. I don’t understand where the problem is. Both the cut list and the instructions call for 4×4 braces. What are wind and snow load ratings for this design ? This carport is not suitable for areas with snow or with heavy winds. This is a project ideal for areas with mild winds and with rain and no snow. Some material list, where do you expect to get 20′ 2×6’s? Not readily available around my area. AND if you can find them they are horribly expensive. That would still leave them 1/4″ short on your dimensions. First of all, you need 22′ and 24′ long rafters for this design. I don’t know how you computed the need for 20′ rafters. Secondly, I don’t expect nothing. I am a designer who happens to share free plans on a blog. If you find these materials too expensive, you don’t have to use my design or you can just not build the double carport in the first place, because any double carport requires long rafters. Cheers! Thanks, Steven! That’s the attitude I like. Take all my plans as starting points and adjust them to suit your own need and then share your experience so you can inspire other builders! What is the cost for the materials? I have no cost estimate. You can print the cut list and add up the local cost of the materials. This is a project long overdue for me. I’ve not gone out to throw one together as plans were not available till now (or till I found yours). I needed a design to get started and you have provided many. I have a few ideas that may make this work better for me such as tying into the existing garage and an 80 yr old pecan tree that I’d rather not lose. I’m no novice as far as diy builds, just nothing to this scale and/or importance. Not to mention something that’s viewed by all as they pass by my house. As to the negative replies, a little common sense and planning might help. Just an opinion. You are not standing in my driveway, I am. I appreciate all your hard work and willingness to share. Take Care, Keep Jammin’ and Keep the Faith! Thank you for the feedback, Kyle. I totally agree with your perspective. Let me know how your project comes out. How much roughly did materials cost? Why would you ask how much did the materials cost? Does this look like a website that sells materials. No, go to home depot or Lowes and ask them, why you ask, cause they are the ones that sale materials. This is a place to find plans not materials. Great plans by the way Jack. I didn’t realize how many idiots this world had. Don’t they know the prices are different from place to place. $1 here but $10 there so how can anyone say the right price. Thanks. It’s ok, Adrian. Thank you for the support. I understand that some people don’t have time to add up the costs and want an estimate right away, but I would rather focus myself on what I do best: designing new plans. This plan is exactly what I need. But I can’t figure out how to buy it or get it other than to copy and paste into Word. What am I missing? Thank you very much for your hard work and dedication. Do you have any idea where can i get 22′ and 24′ 2 x 6. 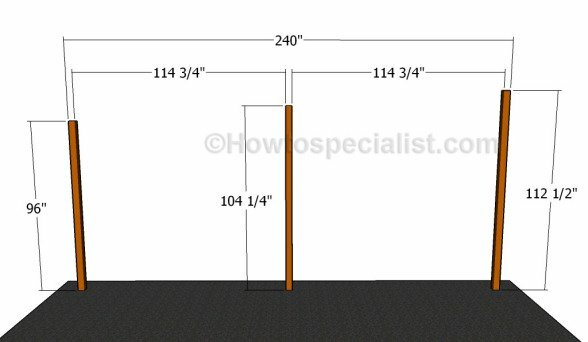 I can not find those rafters and support beam anywhere at my local hardware store (homedepot or Lowes)? Try at the local lumberyard. Do you have any problems with water getting between shingles? I have always been told not to shingle a roof with less than a 3/12 pitch. You are free to choose the product that suits best your local conditions and codes.